We study the initial-boundary problem of dissipative symmetric regularized long wave equations with damping term by finite difference method. A linear three-level implicit finite difference scheme is designed. Existence and uniqueness of numerical solutions are derived. It is proved that the finite difference scheme is of second-order convergence and unconditionally stable by the discrete energy method. Numerical simulations verify that the method is accurate and efficient. Equation (1.3) is explicitly symmetric in the and derivatives and is very similar to the regularized long wave equation that describes shallow water waves and plasma drift waves [2, 3]. The SRLW equation also arises in many other areas of mathematical physics [4–6]. Numerical investigation indicates that interactions of solitary waves are inelastic ; thus, the solitary wave of the SRLWE is not a solution. Research on the wellposedness for its solution and numerical methods has aroused more and more interest. In , Guo studied the existence, uniqueness, and regularity of the numerical solutions for the periodic initial value problem of generalized SRLW by the spectral method. In , Zheng et al. 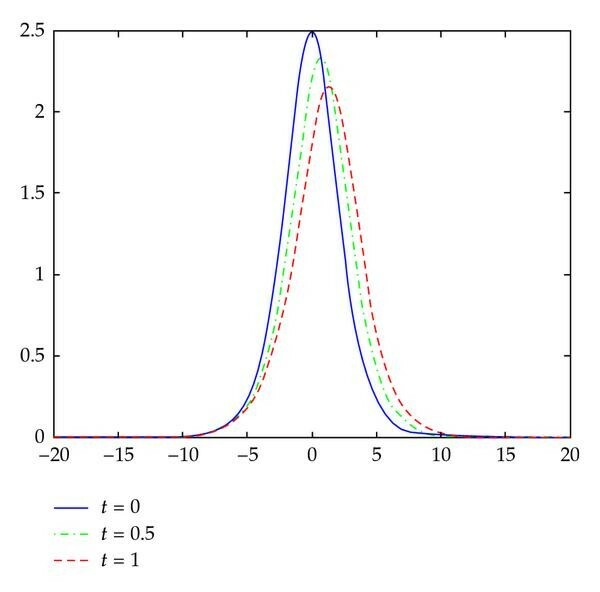 presented a Fourier pseudospectral method with a restraint operator for the SRLWEs and proved its stability and obtained the optimum error estimates. There are other methods such as pseudospectral method, finite difference method for the initial-boundary value problem of SRLWEs (see [9–15]). where are positive constants, is the dissipative coefficient, and is the damping coefficient. Equations (1.4)-(1.5) are a reasonable model to render essential phenomena of nonlinear ion acoustic wave motion when dissipation is considered. Existence, uniqueness, and wellposedness of global solutions to (1.4)-(1.5) are presented (see [16–20]). But it is difficult to find the analytical solution to (1.4)-(1.5), which makes numerical solution important. We show that this difference scheme is uniquely solvable, convergent, and stable in both theoretical and numerical senses. Suppose that , , the solution of (1.4)–(1.7) satisfies , , , and , where is a generic positive constant that varies in the context. So is decreasing with respect to , which implies that , . Then, it indicates that , , and . It is followed from Sobolev inequality that . Lemma 2.2 (discrete Sobolev's inequality [12, 21]). Lemma 2.3 (discrete Gronwall inequality [12, 21]). From Lemma 2.3, we obtain , which implies that, , , and . By Lemma 2.2, we obtain . By Lemma 2.3, we get , which implies that , . It follows from Theorem 2.4 and Lemma 2.2 that , . The solution of (2.2)–(2.5) is unique. which implies that (3.1)-(3.2) have only zero solution. So the solution and of (2.2)–(2.5) is unique. Making use of Taylor expansion, it holds if . Assume that , , then the solution and in the senses of norms and , respectively, to the difference scheme (2.2)–(2.5) converges to the solution of problem (1.4)–(1.7) and the order of convergence is . Similarly to Theorem 4.1, we can prove the result as follows. Under the conditions of Theorem 4.1, the solution and of (2.2)–(2.5) is stable in the senses of norm and , respectively. Since the three-implicit finite difference scheme can not start by itself, we need to select other two-level schemes (such as the C-N Scheme) to get , . Then, reusing initial value , , we can work out . Iterative numerical calculation is not required, for this scheme is linear, so it saves computing time. Let , , , and . Since we do not know the exact solution of (1.4)-(1.5), an error estimates method in  is used: a comparison between the numerical solutions on a coarse mesh and those on a refine mesh is made. We consider the solution on mesh as the reference solution. In Table 1, we give the ratios in the sense of at various time steps. The error ratios in the sense of at various time steps. When , a wave figure comparison of and at various time steps is as in Figures 1 and 2. When , the wave graph of at various times. From Table 1, it is easy to find that the difference scheme in this paper is second-order convergent. Figures 1 and 2 show that the height of wave crest is more and more low with time elapsing due to the effect of damping and dissipativeness. It simulates that the continue energy of problem (1.4)–(1.7) in Lemma 1.1 is digressive. 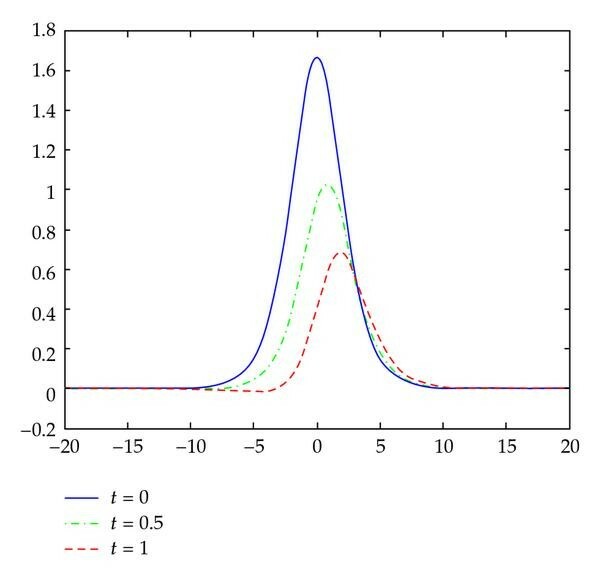 Numerical experiments show that the finite difference scheme is efficient. The work of Jinsong Hu was supported by the research fund of key disciplinary of application mathematics of Xihua University (Grant no. XZD0910-09-1). The work of Youcai Xu was supported by the Youth Research Foundation of Sichuan University (no. 2009SCU11113).